If you are in need of a new RV sewer hose, HannaRV.com has your covered. We carry a vast selection of RV sewer hoses, RV sewer fittings and RV sewer hose storage products from trusted manufacturers like Camco, Thetford, and Valterra. There are several things to consider when choosing the proper RV sewer hose. Hoses come in various lengths and thicknesses, and they are made of different materials. First, you must consider how often you will need to drain your grey and black water tanks. If you are the type of person that only uses their RV on weekends, you may not need a heavy duty RV sewer hose like people who live on the road will. If you only use your RV occassionally, you may want to go with a standard sewer hose like the Valterra Quick Drain. A standard RV sewer hose is completely functional, but it will not be as durable or easy to use as heavy duty hoses. If you are going to be on the road throughout the year, you should consider purchasing a durable, heavy duty RV sewer hose like the Thetford Smart Drain or the Camco Rhinoflex. A heavy duty RV sewer hose will be more expensive than a standard hose, but it will be virtually crushproof and able to withstand extreme duty usage. Another thing to consider when selecting a sewer hose is the length you will need. Kits come in 15 and 20 foot lengths, and extension hoses come in various lengths. Typically, a 15 foot RV sewer hose will be long enough, but at some parks and campgrounds you will need a longer hose to reach the dump station. Let's face it, nobody likes the sight of a dirty RV sewer hose. Luckily there are a few RV sewer hose storage products that make it easy to keep your hose safe and out out of sight while you are not using it. Many people store their RV sewer hose in the bumper of their vehicle. Most RV bumpers are 4 inches tall and 4 inches wide. They are hollow, which makes them a perfect place for RV sewer hose storage. 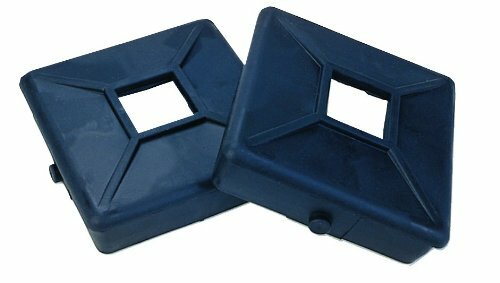 We sell removable 4 inch rubber bumper caps that make storing your sewer hose in your RV's bumper a breeze. If you do not have a 4 inch bumper on your RV, you may want to consider mounting a sewer hose carrier to your RV. Sewer hose carriers come in a variety of sizes to fit your specific needs. They are easy to install, and they keep your RV sewer hose out of sight while you are not using it. There are a variety of RV sewer fittings that you will need to make secure connections at the RV dump station. Some RV sewer hose kits, like the Rhinoflex 20 Foot Kit, include all of the RV sewer fittings you will need to drain your waste tanks. RV sewer fittings like the Valterra EZ Coupler Sewer Adapter make connecting your sewer hose to different sized sewer outlets a breeze. RV Sewer Hose Adapters allow you to connect multiple hoses together, or make an easy connection to your RV's waste valve. RV Sewer Hose Supports like the Camco Sidewinder make draining your RV's holding tanks quick and easy, as they lift your hoses off the ground providing a downhill waste flow. In the chart below, you will find all of the RV sewer hoses we offer along with what material they are made of, and what application they have. A good way to differentiate sewer hoses is by comparing their mil thickness (1 mil = .001 inches). An RV sewer hose that is made of 25 mil vinyl will be much more durable and long lasting than a 12 mil vinyl hose. The infrequent RVer who goes on a few trips a year can go with a standard RV sewer hose like the Valterra Quick Drain. Weekend RVers should consider purchasing an RV sewer hose that is thicker and more durable, like the Camco Heavy Duty RV Sewer Hose. Hoses with the Full Time RVer designtation, like the Camco Rhinoflex are rugged, and have been proven to withstand frequent use. Are you a new RVer? Check out the video below to learn some helpful sewer hose tips and tricks!